The food packaging market is segmented on the basis of material, types, application, and geography. The material involved in food packaging are paper & board, rigid & flexible plastic, glass, and metal. The segmentation of the market, on the basis of application includes bakery, confectionery, dairy products, convenience foods , sauces, dressings & condiments, fruits & vegetables, meat, fish & poultry, and other products. The geographical segmentation of the market includes four regions: North America, Europe, Asia-Pacific, and Rest of the World (RoW). The key countries of these regions have also been studied. 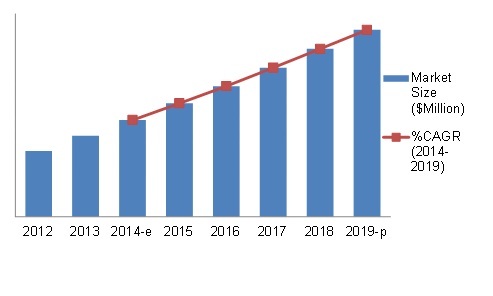 The food packaging market is projected to reach a value of $305,955.1 Million by 2019 and Asia-Pacific market is projected to grow at the highest CAGR during forecasted period. 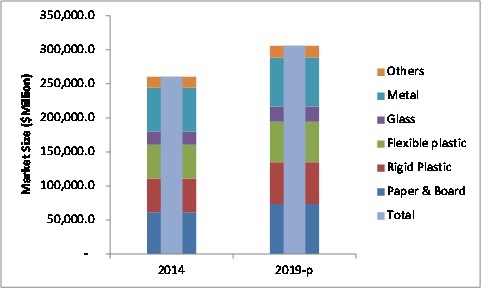 In 2014, the rigid and flexible plastics segments, together, held the largest market share, in terms of material, and were subsequently followed by the metal, and paper & board segments. The paper & board segments are estimated to grow at the highest CAGR from 2014 to 2019. This report includes market size, in terms of value ($million). It provides both, qualitative and quantitative analyses of the food packaging market, the competitive landscape, and the preferred development strategies of key players. The key players invest heavily in the expansion of their business and development of new food packaging material to maintain a competitive edge in the market. The key players were observed to prefer new joint ventures, agreements, collaborations, and expansions as strategies to enhance their production facilities and acquire a larger share in the market. The report provides a complete analysis of the key companies and a chronology of developments with respect to new products and their applications. It also analyzes the market dynamics, winning imperatives, and issues faced by the leading players. The research study categorizes the food packaging market on the basis of material, type, application, and geography. The food packaging market has been segmented on the basis of materials, which include paper & board, rigid & flexible plastic, glass, metal. The applications of food packaging include bakery, confectionery, dairy products, convenience foods, sauces, dressings, condiments, fruits & vegetables, meat, fish & poultry, and others. The demand for convenience and packaged foods drives the market. This report includes the market size, in terms of value ($million). 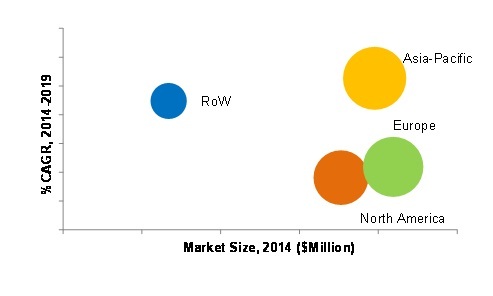 Additionally, the food packaging market is segmented on the basis of region into North America, Europe, Asia-Pacific, and Rest of the World (ROW). It provides both, qualitative and quantitative analyses of the food packaging materials market, competitor analysis, and preferred development strategies of key players. The market for food packaging market is projected to reach a value of $305,955.1 million by 2019, with the preference for specialty packaged products rising with the escalating economic growth in emerging markets. In 2014, the Asia-Pacific region is expected to be the fastest growing market for food packaging market. The leading companies of the market are using new product launches, acquisition, joint ventures, and expansion as growth and development strategies. This report provides analyses of the prominent players and the strategies used by them to maintain their market position. Key players such as Amcor Ltd. (Australia), Rock-Tenn Company (U.S.), Sealed Air Corp. (U.S.), Nuconic Packaging LLC (U.S.), Tetra Pak International S.A. (Switzerland), and Crown Holdings, Inc. (U.S.) have been profiled in the report. 12.10 Tetra Pak International S.A.